Unless Cave Carson is unexpectedly spectacular, Cecil Castellucci's Shade, the Changing Girl Vol. 1: Earth Girl Made Easy may turn out to be the best of Gerard Way's Young Animal debuts. Emerging somewhere between Heathers and Edward Scissorhands with a heavy aesthetic of 1980s teen movie, Shade is strange and fun, effortlessly shifting between the serious, mundane, and absurd, from alien moonscapes to psychedelic art to high school classrooms. Castellucci and artist Marley Zarcone create a weird, immersive world that goes perhaps to Young Animal's mandate of distinct art styles more than any of the imprint's other titles I've read so far. Castellucci's Shade is smart -- there's high school drama on its own, but then sometimes it backs up into a whodunit mystery, and then cuts to the planet Meta. But visually, Shade is an odd, wonderful trip. Whenever alien Loma Shade's on the panel -- having put on the Madness Vest and taken over the body of Earth-girl Megan Boyer -- little "madness rings" float nearby, and the longer Shade stays in one place, the weirder the scenery becomes. We see at times the characters' emotions floating over their heads; at other times, imaginary figures reach out from the backgrounds. How much is actually "there" is always in question; some characters can see the madness and others can't, and sometimes people even appear to see the madness when they really don't -- a nurse on the fourth page is being touched by a living skeleton, but no one ever seems concerned for instance that there was a living skeleton. The reader's perspective is constantly being challenged -- what's happening, what's not, what's real, what's temporary -- and it makes Zarcone's every panel worth scrutinizing. The creative team also repeats a three-panel page device throughout the book that's very effective. Especially toward the end of the book, Shade moves very quickly, flipping through days and nights; sometimes the three panels serve to check in on different characters quickly, and sometimes they parallel events separated by galaxies, but always the pages bring a stark immediacy to a book that's very often spinning out of control. Equally Castellucci tends to interrupt the shenanigans with reminders that we don't yet know exactly how Megan was injured at Yarrow Lake (and which of her friends might very well try to do away with her again). Toward the beginning of Earth Girl Made Easy I had some difficulty appreciating Megan's "horribleness"; she seems to have very stark control over the other girls on her synchronized swimming team (Castellucci again mixing the serious with the absurd) but to some extent this seemed overdone. Toward the middle of the book, however, we begin to see Megan's emotional manipulation of childhood friend "Teacup," plus a pseudo-Facebook group for victims of Megan's bullying, and at the end of the book, Castellucci finally reveals a page from Megan's "burn book." At this point Megan's evil is truly revealed (quite aside from her ghostly apparition becoming the villain of the piece), with evidence of blackmail, controlled isolation of Teacup, and so on; Castellucci does well to make Megan a chilling figure. Though I thought the "all is forgiven" ending came off too clean, I'm eager to see what threats Castellucci sends Shade up again next; at the same time I believe we're to understand in the end that Shade is now pregnant with some aspect of Megan, and I'm glad Shade's "arch-nemesis" is remaining close at hand. Undoubtedly Meta will play an increasing role in this book. I liked how similar Castellucci made Meta to Earth; young adults on Meta fool around and drink and play in garage bands in the evening. That Castellucci specifically points out through footnote that Meta has a word for "draconian" the same as Earth does reinforces the sameness of the two cultures even if some Metans are tentacled; also that a black-and-white American sitcom with sexist undertones is the most popular program in the universe. Meta is also the site of some of Castellucci's more clever and mature-leaning material, like the idea that Lorna Shade is "species fluid." Still, in all of this I felt the book had a strong expectation of the reader to be familiar with the adventures of Rac Shade, which I am not, and that left me scratching my head at times. Something else that left me scratching my head was Shade's backup stories. I recognize how these stories of obscure DC Comics characters by independent or up-and-coming creative teams also meshes with Young Animal's values, but by and large these are too hurried to be entertaining; the "Gotham Radio" story in Mother Panic at least seemed to take place in the same world as its parent title. 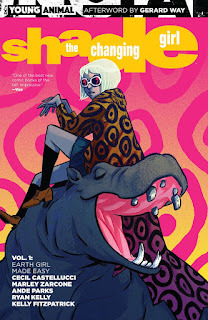 But at its best Cecil Castellucci and Marley Zarcone's Shade, the Changing Girl Vol. 1: Earth Girl Made Easy is again strange and fun and also dark and foreboding, reminiscent even a bit of DC's recent Prez series by Mark Russell and Ben Caldwell. Truly, I think, the best of Young Animal; I'm really not sure where Castellucci is going to take the characters next time but I'm curious to find out. Shade and Cave Carson have one thing in common, they are both completely bonkers but in completely different ways. Shade is a deep undertoned, dark acid flash-back, exploration of character character and soul. Cave Carson is a Flash Gordon serial mixed with dashes of Carpenter's The Thing, Escape From New York and Big Trouble In Little China dealing with trippy, psycho-social, corporate, family shenanigans. I really enjoy them both on completely different levels, but Cave Carson edges it for me because Wild Dog. (Not just Wild Dog, obviously, but he's one of my absolute favourite characters and it is beyond awesome to see him in anything, especially something as good as Cave Carson). I had forgotten about Wild Dog in Cave Carson, but that might be a reason for me to check out the book sooner rather than later.